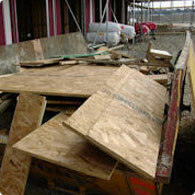 Global Environmental are experts in the management of construction waste. Our waste specialists can pass on their expertise and experience to help developers and contractors to comply with their legal duties and ensure construction waste is managed in the most economical and sustainable way possible. We help you to prepare and maintain a Site Waste Management Plan (SWMP) which estimates the quantity of each type of waste expected to be produced and tracks their recovery and destination throughout the lifecycle of construction projects. Our waste consultants will help you devise and implement methods to maximise the amount of waste you recover including techniques to segregate/sort waste into individual material streams. We can advise you on innovative ways to re-use waste products in the build-phase and identify local markets to maximise your recycling rates while reducing the amount of material you remove to landfill.